To help you get started with Articulate Engage '13, we created this series of beginner tutorials to walk you through creating your first interaction using many of the most common features. They'll help you get up and running quickly. They're not exhaustive tutorials, but they do cover the basics. If you want more specific details, see the in-depth Engage tutorials here. If you have a question, feel free to jump into the community forums and ask. 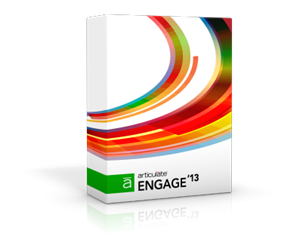 Articulate Engage '13 is a great way to quickly and easily add powerful interactivity to the e-learning courses you build in Presenter—or if you prefer, you can use it to create dynamic, standalone e-learning content. Watch this overview of Engage, then jump into the video tutorials and practice activities that follow.